Planting hanging baskets and containers at home is the perfect way to create gorgeous flowering displays that best fit your home and landscape. And, a great way to save on the budget too! Let’s face it, purchasing ready-made baskets and planters can be pricey. And often, selections are limited to just a few boring choices. 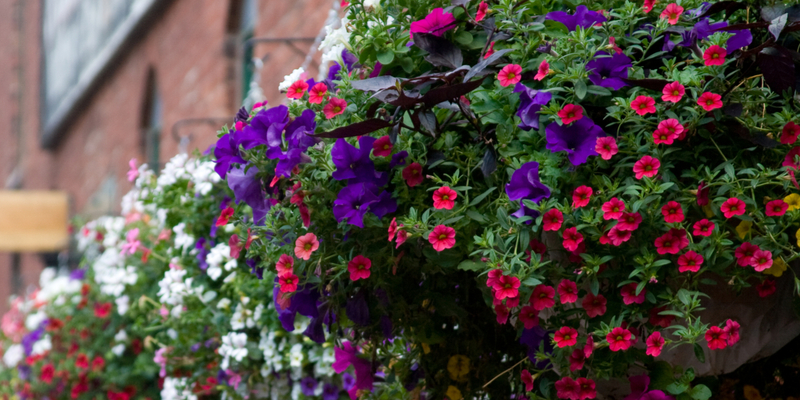 Hanging baskets are a great way to add instant color to porches, patios and entrance ways. But planting hanging baskets at home can change all of that. And, in the process, help create unique baskets with stunning colors that will be the envy of the neighborhood. Here are five annuals that are perfect for baskets – providing both big color and long-lasting blooms. The wispy, colorful blooms of verbena make for interesting, beautiful and durable hanging baskets. Verbena’s light and airy blooms hold up well through the summer heat. It’s ability to flow and cascade over the top of planters make it ideal for hanging baskets. Available in colors ranging from blue and pink, to purple, red and white, verbena’s light foliage contrasts well with its showy blooms. Verbena is also somewhat deer and drought resistant. Two great qualities when it comes to container plants! Lantana is actually a broadleaf perennial shrub in tropical climates. However, when grown as an annual, it provides loads of overflowing blooms. And, to boot, in a wide range of near-fluorescent colors. Lantana plants fill their foliage with long-lasting, tiny clusters of colorful blooms. And those blooms range from white, orange and yellow, to vibrant purple and red. The plant is extremely sturdy and holds up well in the summer heat. The sturdy branches almost appear to flow over the edges of baskets as they grow. Have a shady area that needs a big pop of color? Then impatiens are the choice for you! Impatiens thrive in the shadier parts of the landscape. They make an excellent choice for patios and porches. Impatiens are loaded with color – like this salmon-colored variety. Impatiens are available in a wide array of colors, from white, red and pink, to violet, coral and various shades of purple. For sunnier locations, try the New Guinea varieties. They have similar blooms, but handle sunlight in higher doses. When it comes to planting hanging baskets in a unique style, here is a chance to think outside the box! Ornamental peppers add a bit of spice to hanging baskets. They make for a great conversation piece. Sangria, and McMahon Bird Pepper are two hot pepper varieties that exceptional for container planting. Ornamental hot peppers stand up to intense sunlight and heat. It makes them ideal for full-sun locations. When it comes to planting hanging baskets, begonias are a great choice for tough conditions. They stand up well to both full sun and high heat. When it comes to choosing annuals for harsh locations, begonias are a great choice. Begonias deep waxy foliage is a beautiful contrast against its showy and colorful blooms. Begonias will continue blooming up until the first hard frost. Here is to planting your own hanging baskets this year! August 15, 2018 TIMG Comments Off on How To Freeze Tomatoes – 3 Easy Ways To Preserve Without Canning!